Larry's books have been endorsed by relationship expert Dr John Gray, the author of "Men are from Mars, Women are from Venus," and other therapists, ministers and celebrity authors. Larry James and Dr. John Gray, Ph.D.
All three of Larry's books were listed in the "TOP 5 Non-Fiction Romance" books on Addicted-to-Romance.com. "Red Hot LoveNotes for Lovers," "How to Really Love the One You're With" and "LoveNotes for Lovers" were listed as #2, #3 and #4. The books that Larry James has written are published by Career Assurance Press and are available nationwide through major bookstores and online booksellers. 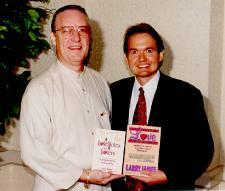 Larry's relationship books have been described as "a song that goes on singing." If you would like for Larry to personally sign one or all of his relationship books to someone you love, call the secure Toll-Free number listed below. (As seen on ABC TV's "The View"
an assortment of sample LoveNotes! If you have read any of Larry's three relationship books, please write your own book review! Here are some very special tips and suggestions about "How to Get the Most From Reading a Relationship Book." The three books above are available from major bookstores nationwide and online booksellers. Some retailers occasionally offer discounts. Direct links for online purchase are provided on each indiviual book page. For quantity discounts, contact Larry James at CelebrateLove.com at the address below. NOTE: Larry's first book, "The First Book of LifeSkills: 10 Ways to Maximize Your Personal and Professional Potential" has been re-released and is now available from Sage Creek Press. Not available in bookstores. Larry James has a limited supply avaiilable and will personally sign each copy. Call: 480-998-9411 to order! 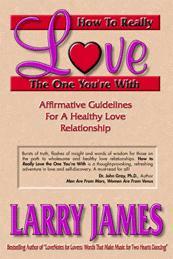 Relationship books by Larry James are published by. . .